The Christmas spirit has done nothing to improve matters at the English National Opera alas. Just read this. But I am glad to report that all is reasonably well here at COT. We did good business over the last week in donations and box office revenue - but we need that to continue so do not relax! The temperature is mild in Chicago and all in all we are cheerful mood in the run up to the beginning of our production period. Just over two weeks remain before Dido and Padlock start their month of preparation. Post script to the above: A milestone - this evening I reached the magical fifteen thousand - that is 15,000 hits on this blog since I started doing this insane thing in April! A very happy New Year to all my readers! I am indebted to one of my friendly readers for drawing my attention to a piece in the New York Observer which shows that the English National Opera's board problems are a shadow of what is possible! This is the stuff that nightmares are made of. Riveting!! This is a time for family and enjoyment of life together. And this is much aided by a really good new cook book, The Silver Spoon, from Phaidon- a wonderful Christmas present for this cook in our family! It is the first English translation of an Italian classic. Get it if you possibly can - its out of print but will be back in the New Year. Of course its no use of you don't like Italian cooking. But you wouldn't be reading this blog if that were the case. Anyone still interested in the nonsense that is going on at the English National Opera can feed on The Times , the Telegraph, and the Guardian stories in this morning's London papers. This all looks absurd from this vantage point. But there are lessons. The key is respect - the relationship between the Chairman of the Board and the Executive, as a whole - not just the CEO, is fundamental. In England, as I believe here in Chicago and at the Met, there have been fantastic relationships based on these values. One only has to think of Bill Graham and Ardis Krainik here in Chicago. A recipe for success at all levels. And Garrett Drogheda and Claus Moser as Chairmen at Covent Garden in partnership with John Tooley were exemplary. And we know that this did not preclude robust expression of strongly and authoratatively held dissenting opinions from time to time. And above all my old boss at Glyndebourne, George Christie - Chairman for 40 years. He trusted his management to do the job - and supported them while being extraordinarily knowledgeable, wise, and sympathetic counsel, critical when he felt it necessary but always fiercely loyal to his "generals". ENO will no doubt get through this. But its going to require some substantial leadership. Not easy! I am running out of space here so I have deleted the photo albums to make room for rehearsal and production photos that I will be posting most days one we get into production from January 15. Any company members who would like copies of production photos of last season's Resurrezione, Figaro, and Midsummer Night's Dream should contact me. The English National Opera's widely unpopular Chairman resigned this morning, to general rejoicing apparently. Balance between the governing board of an arts organisation and the executive is not normally difficult to achieve - however, in this case there has been a huge problem so this was clearly the only way out. We must wish this great company well. I am sure that it will rebound in the same way as Covent Garden did after a similar period of Board Chairman led strife in the late '90s. No doubt the new Artistic Director and Executive Director who were appointed with unseemly haste after the "resignation" of Sean Doran will be wondering what comes next! I have no doubt that the fearsome Charlotte Higgins, Arts Correspondent of the Guardian, will be weighing in. So watch the Guardian for the ongoing story! It was a real treat late this afternoon to have a visit from Jill Rye and her family. Many of my readers know Jill of course as the greatly loved Artists Relations Manager who left COT last year for the birth of her son Henry. 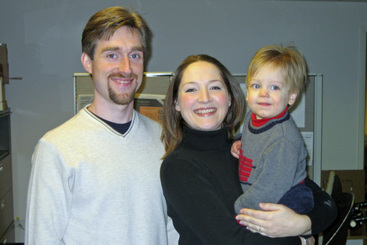 We thought that you would like to have an up to date pic of Andrew, Jill and Henry. 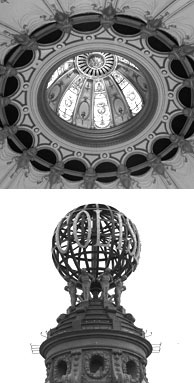 So here they are - click left to enlarge then click right to save to your own computer. I have been rather idle - I should have posted this over the weekend. We went to an excellent party on Friday evening - the American Opera Society of Chicago's "Holiday Gala". This annual event took place at the Fortnightly Club - a splendid house on East Bellevue at Lake Shore Drive. The American Opera Society has roots back to 1921 with the Opera in our Language Foundation founded by two formidable Chicago ladies Eleanor Everest Freer and Edith Rockefeller McCormack. The Society provides funds for scholarships and general monetary assistance to young American artists as well as encouraging and supporting the enjoyment of what we would call good music. The current President is another formidable Chicago lady, Rose Ann Grundman to whom many distinguished Chicago singers over many years owe their gratitude. And two of them, Christian and Kellie Van Horn presented an enjoyable program on Friday. The evening was completed by a major contribution from the Chicago Children's Choir conducted by their remarkable Artistic Director Josephine Lee. And today I had lunch with Peter Debreceny, the man who turned me into a blogger, at the relatively new and widely welcomed Osteria via Stato. Great value for lunch - and a little pricier in the evening. But a really welcome high quality addition to the Chicago restaurant repertoire. Peter will, we hope, join COT's board in 2006. He will be a wonderful acquisition. The world of music's fringe does seem to breed some pretty extreme specimens. Witness the latest effort by a somewhat eccentric but nevertheless widely read and broadly respected Norman Lebrecht, formerly of the Daily Telegraph and (I think also formerly) the Evening Standard in London - and a regular broadcast columnist and commentator on BBC Radio 3. He is now ranting in an extraordinarily intemperate way (putting me to shame I should say) about Mozart of all people. Just read this. Mozart was no doubt an odd bird - but then so were Britten and Wagner. So what? Lets not get into what drives genius. I had intended to post my rankings of the schools I visited in November some weeks ago. Sorry they are late - all the excitement of Christmas parties and WORK has held me up. Some explanation is needed. This is nothing more than my impression of the quality, as presented to me at these auditions, of the singers at these schools. So this is just a random snapshot of what was offered. But it ought to be somewhat indicative of the level in each school. But you need to know my "scoring" system. A 1 is a star, a 2 is a terrific singer whom I would hire as a first choice for the roles that he/she is suitable for. A 3 is an excellent young singer who is capable of performing strongly in a high level company. A 4, 5, or 6 is another story altogether. So a school with an average score of over 4 is not doing so well. Anything less that 4 is ok given that there will be a few weaker ones to bring the average down. Anything approaching 3 or under is remarkable – indicating not only strength but also an absence of weaker singers. And Yale, Northwestern and Juilliard on this occasion were remarkable. I was perplexed by Northwestern because they were never so strong in the recent past. I am delighted to see what has happened. Maybe I never heard the undergraduates before. They have some great ones this year. 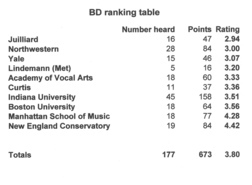 So here is the table with the number of singers auditioning, the total scored, and the average which gives the “ranking” of the school. Lower is better of course. Click on the table to enlarge it.